Fifteen years of Parasail Industry experience allows our design team to produce the longest lasting, high-lift, low-drag parasail chute designs. This means less chute change out as wind conditions vary. Under normal conditions, Commercial Parasail Operators have been able to operate safely with a collection of 2 to 3 sizes of chutes. Whereas before, they required a broader selection and number of canopies. This saves our commercial customer time and money in canopy purchase and on the water operations. Our larger HLLD canopies are successfully inflated on all winch boats with our innovative Launch Bar System (see bar). High lift/low drag designed chutes are indicated below. 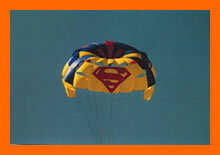 Every Parasail Workshop Chute is built with the finest materials available to our industry. All rip stop nylon is strong, Sun Fast and Silicone Coated, hardware is 100% stainless steel, and our Harness and Webbing material is superb. 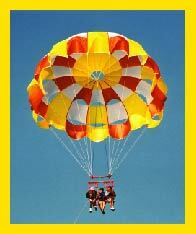 Ask a Parasail Workshop expert for canopy selection assistance. HLLD=High Lift/Low Drag. Winch boat systems and parts available. All makes. Double your production! Padded, Strong, Preferred Design. All Stainless Steel Construction. 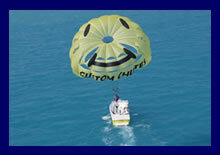 Available for CWS, Paracraft and Premium Parasail Boats. Triple your production! Padded, Strong, Preferred Design. Copyright © 2002/2015 Parasail Workshop, Inc., All Rights Reserved.